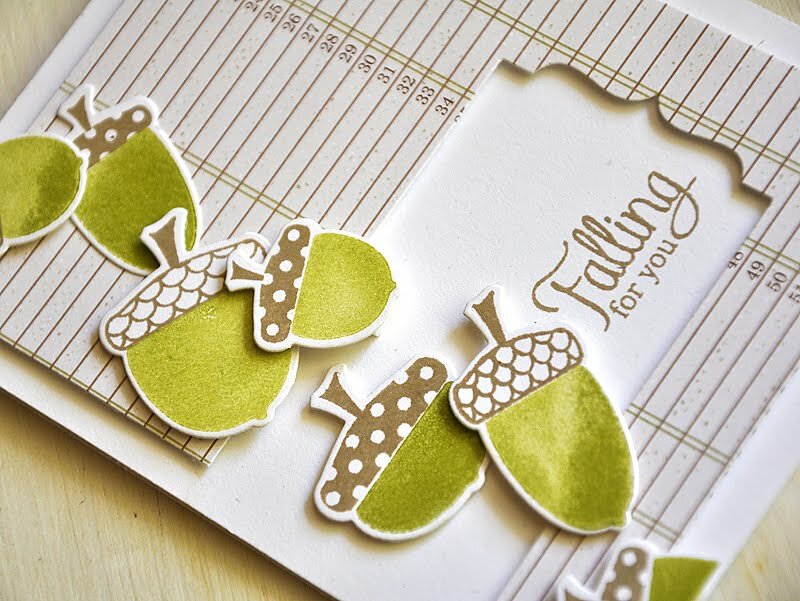 Here's a fun assortment of colorful acorns from the new Autumn Acorns set. Stamped them in Summer Sunrise, Raspberry Fizz, Plum Pudding, Hawaiian Shores & Dark Chocolate onto Rustic Cream Cardstock. 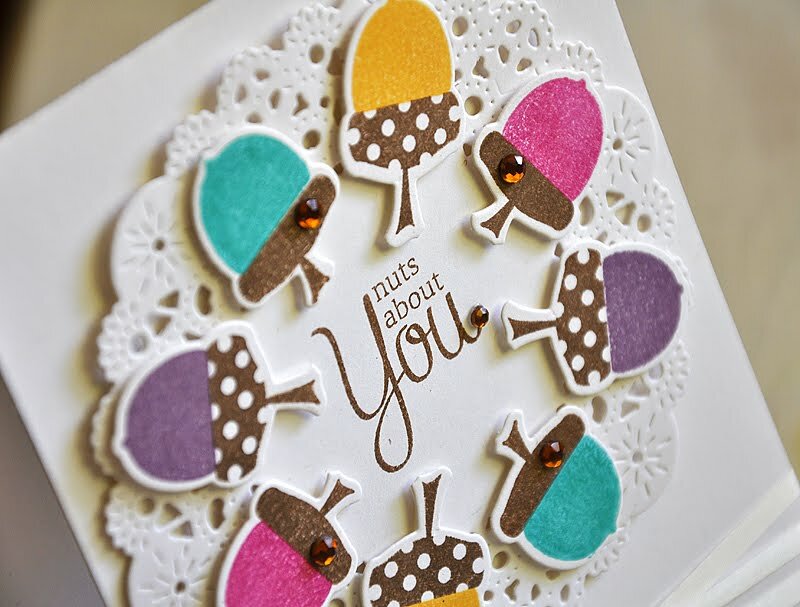 Arranged and attached the acorns on top of a die cut Parisian Lace Doily. 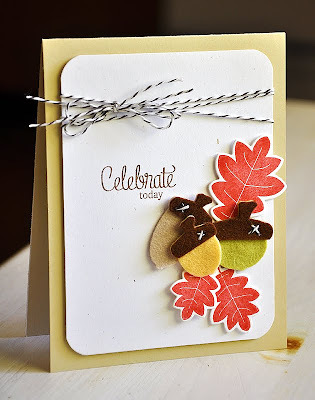 Stamped the center with a Autumn Acorns sentiment and embellished with rhinestones. Then finished the card off with a wrapping of 1/8" silk ribbon. That's it from me today, I'm off to finish packing. Hope you enjoyed today card and thanks for stopping by. Have a wonderful one! Since the Papertrey Ink August release has come to an end, I've got the rest of my release cards to share with you today. So, let me get started!... First up, Nichole Heady's stunning set, Harvest Berries. 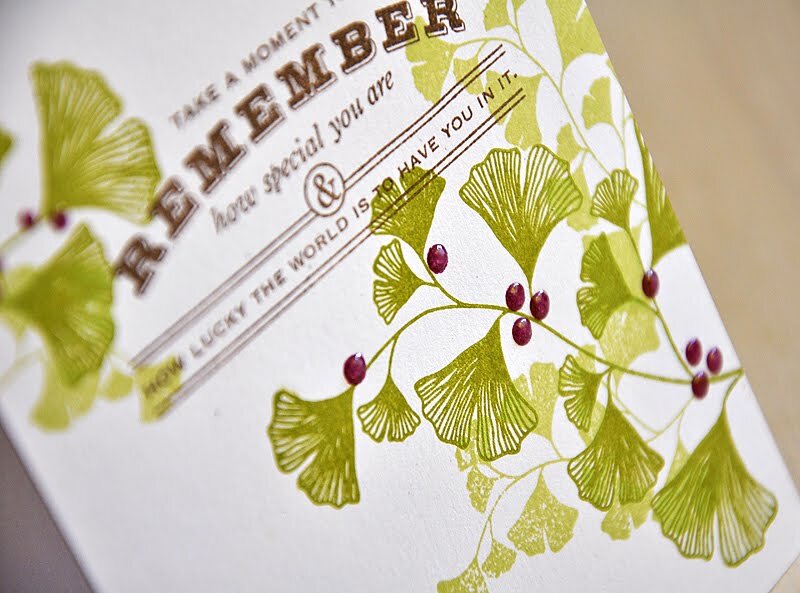 Started this single layer creation by stamping both the solid and outlined ginko leaves, in Simply Chartreuse and Spring Moss, onto a Rustic White card base. Layered Scarlet Jewel berries, then glazed them over with some Glossy Accents. Finished it off with a sentiment from the same stamp set. Next up, Melissa Bickford's new Flower Fusion #7. I paired this set with a few vine stripes, from Background Basics: Vines, stamped in Scarlet Jewel, Sweet Blush and Orange Zest. 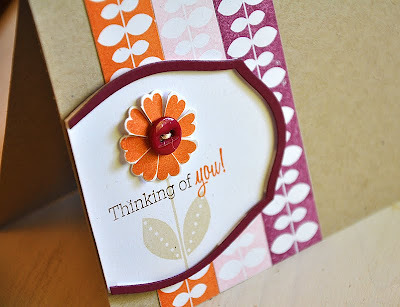 Created an image panel by stamping the flower, stem and sentiment onto a Rustic White Layerz Mat Stack 1 die cut. 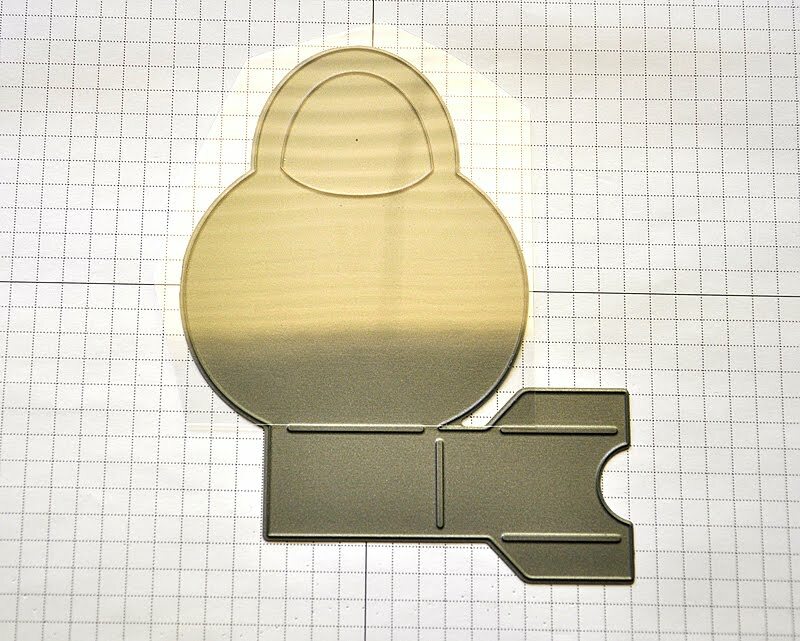 Created and attached a thin Scarlet Jewel frame, created by die cutting a Mat Stack 1 die from a Layerz Mat Stack 1 die cut. 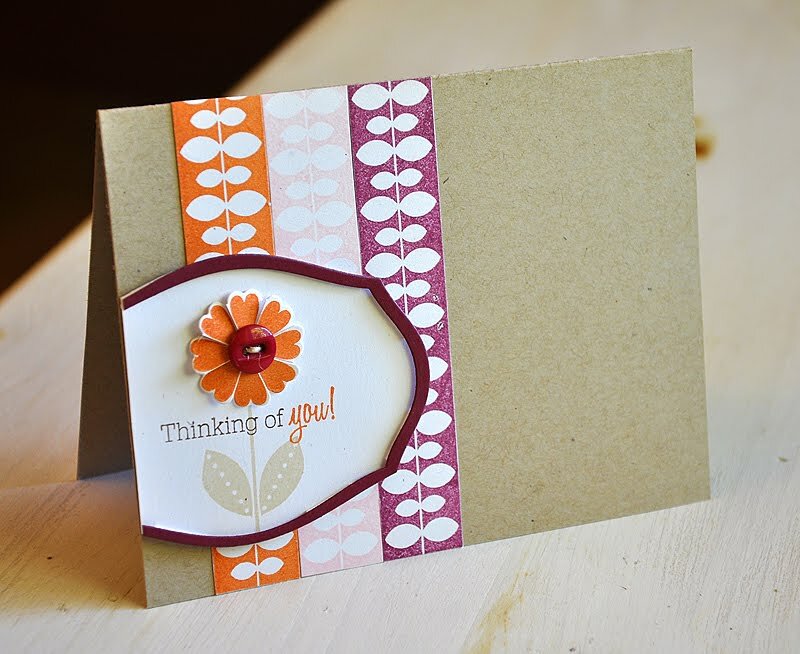 Next, Think Big Favorites #7, featuring a few sentiments from Melissa Bickford's Asian Fusion. Stamped the birthday sentiment onto a Kraft card base. Paired it with one of my new stamp sets from the month, Autumn Acorns. 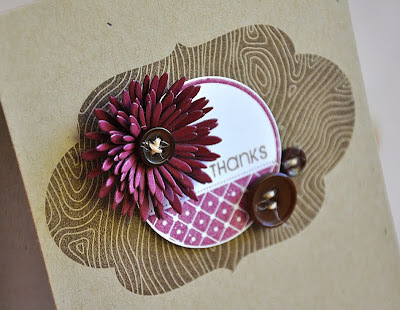 I die cut, stamped, trimmed and attached the acorn tops onto a few buttons. 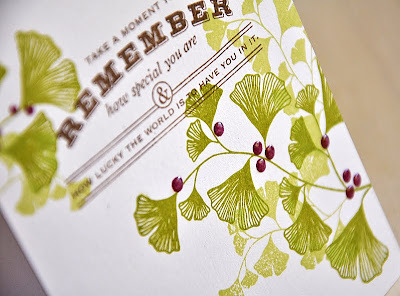 Then attached them to the card base over a few stamped leaves. Another set designed by Nichole Heady, Table Service. This set is a fun one, so many possibilities and I can't wait to play with it again! 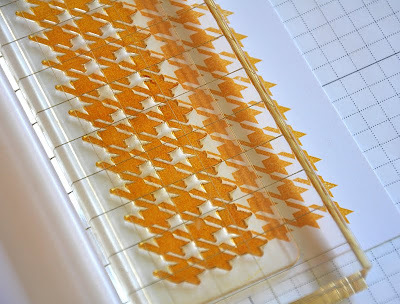 Started by stamping a sort of table runner, using vines from Background Bascis: Vines stamped in Orange Zest. 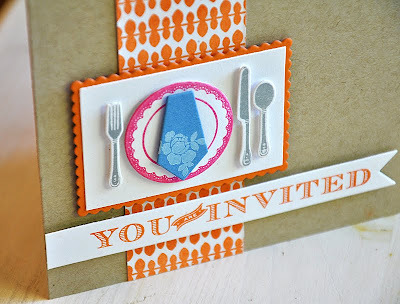 Die cut, stamped and attached a table setting and finished it off with a perfect little banner sentiment. All in a fun color combo of Orange Zest, Blueberry Sky, Hibiscus Burst and Smoky Shadow. 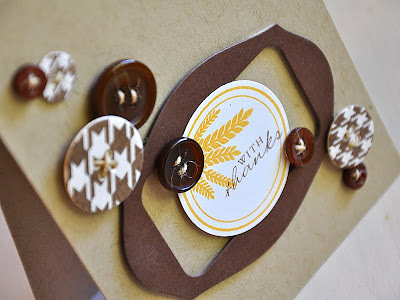 Here's one of Heather Nichole's new sets for the month, Tag-its #7, combined with Modern Wood Mats by Nichole Heady. 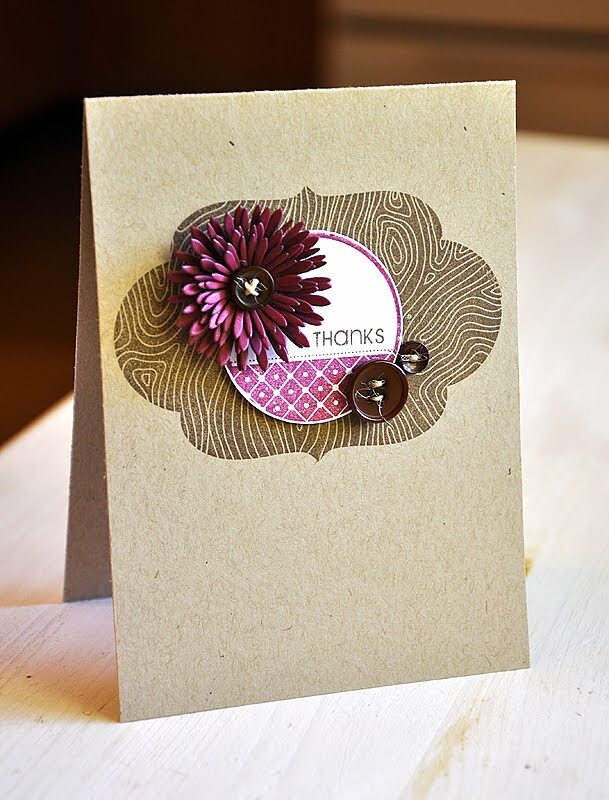 Embellished this simple card with a small Scarlet Jewel Bloom Builders #3 (used only a couple of the bloom layers to create a smaller version of this gorgeous bloom) and a few Dark Chocolate buttons. 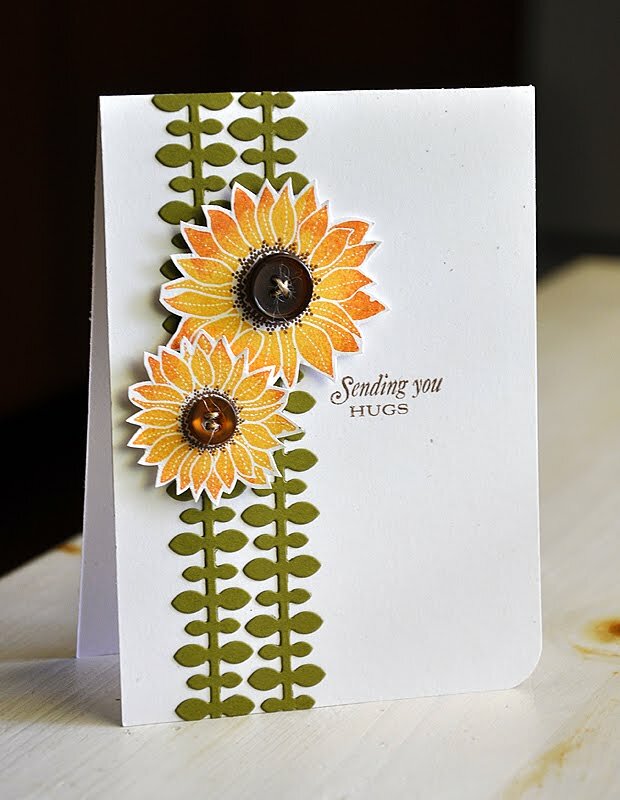 And finally, Simply Sunflower also by Nichole Heady. 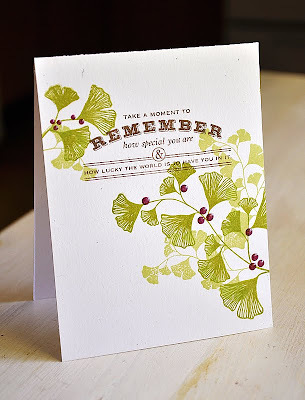 I die cut and attached a couple Leafy Vine Border die cuts onto a Rustic White card base. Stamped a couple sunflowers, using the Rock and Roll technique, attached over the vines and embellished with Dark Chocolate button centers. Yay! 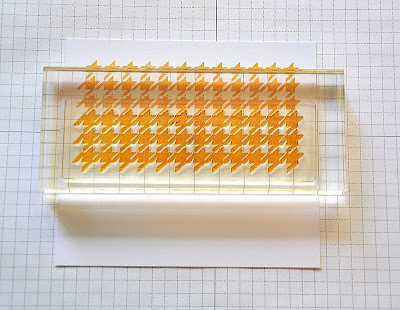 It's day five of the Papertrey Ink Countdown! 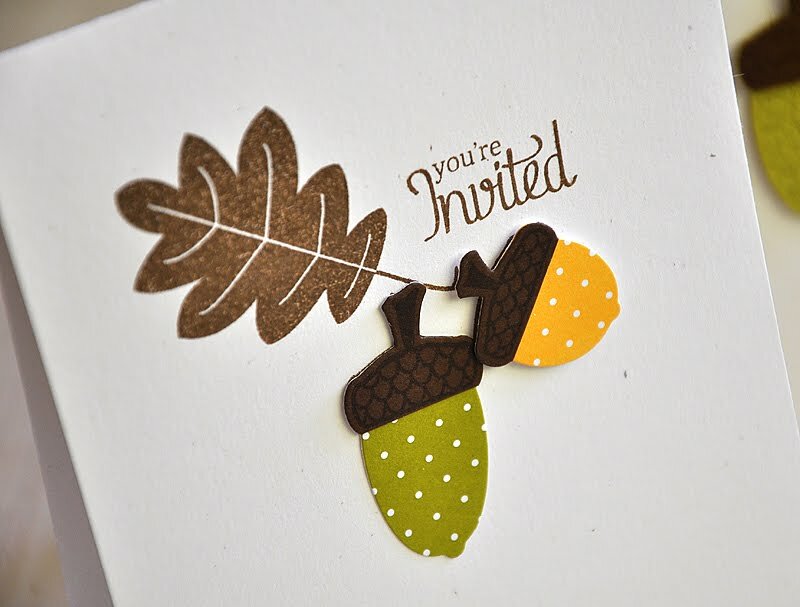 And that means.... all that you've seen peeks of these past few days (Aututmn Acorns, Autumn Acorns Die Collection & Background Basics: Houndstooth) will be available tomorrow, August 15th, at Papertrey Ink. 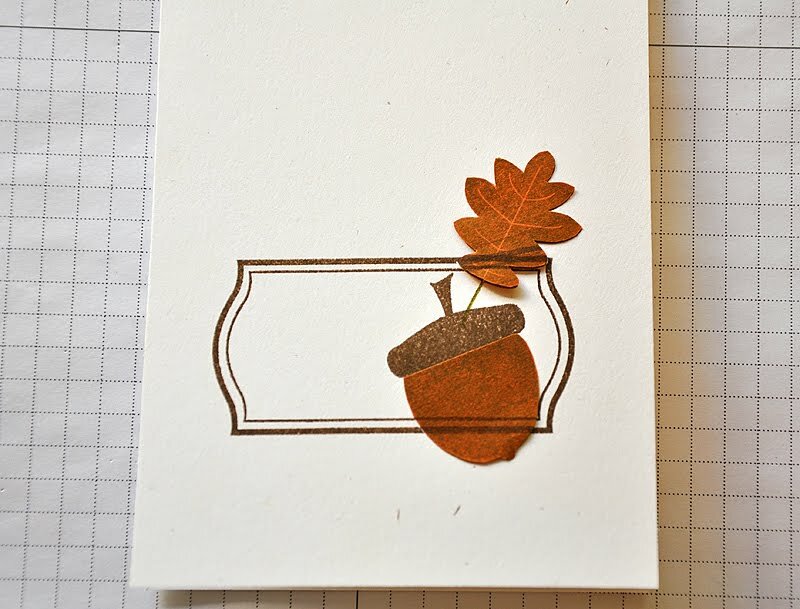 I've got a couple more creations to share with you before this Countdown comes to an end... First up a sweet friendship card using Autumn Acorns. 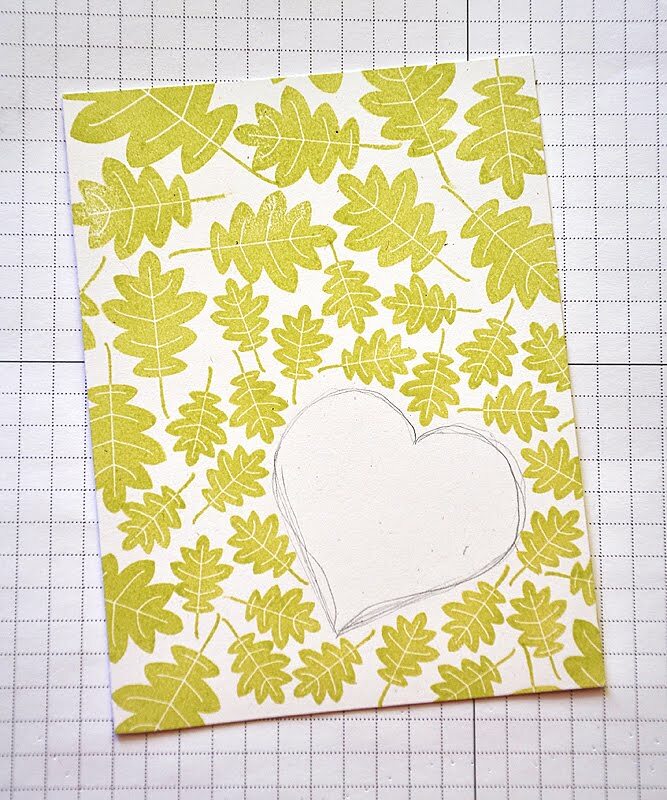 I began this card by lightly drawing, by hand, an outline of a heart onto a Rustic White cardstock block. 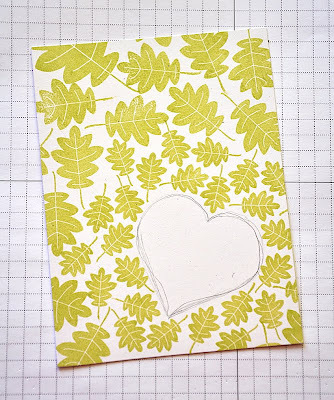 Inked the smallest leaves in Spring Moss and stamp around the heart. I then moved up a leaf size and began to stamp around the small leaves. Then erased the heart. Within the heart space I stamped a outline heart image (from the 2010 Love Tags set), a sentiment and two small acorns (from the Autumn Acorns set). 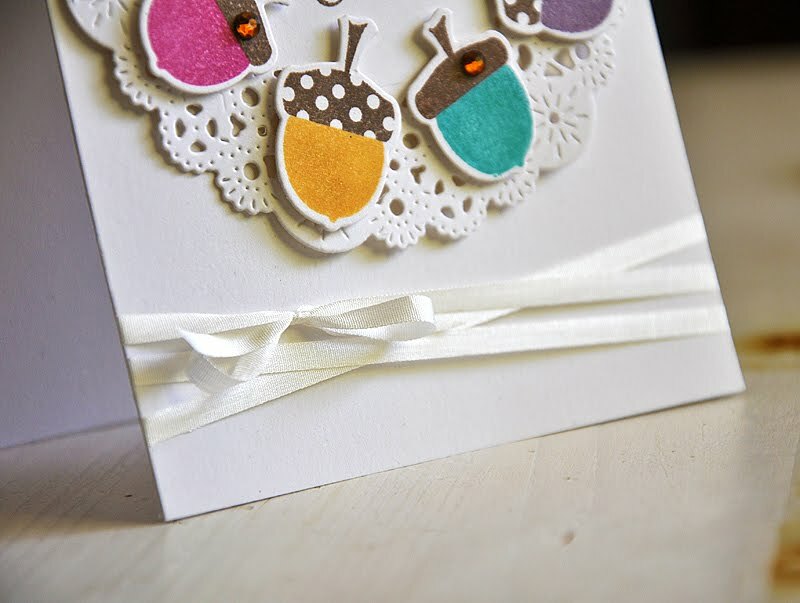 Embellished with rhinestones and white silk ribbon and then attached to a Rustic Cream card base. 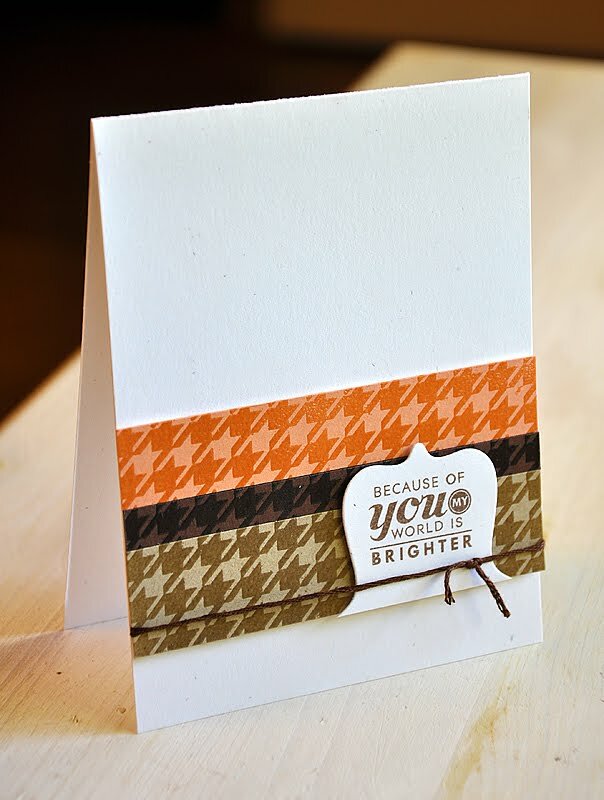 This next single layer card pairs Autumn Acorns with Background Basics: Houndstooth. 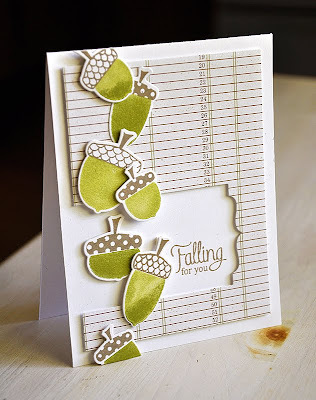 I began by stamping an acorn bottom in spring moss onto a Rustic White card base. 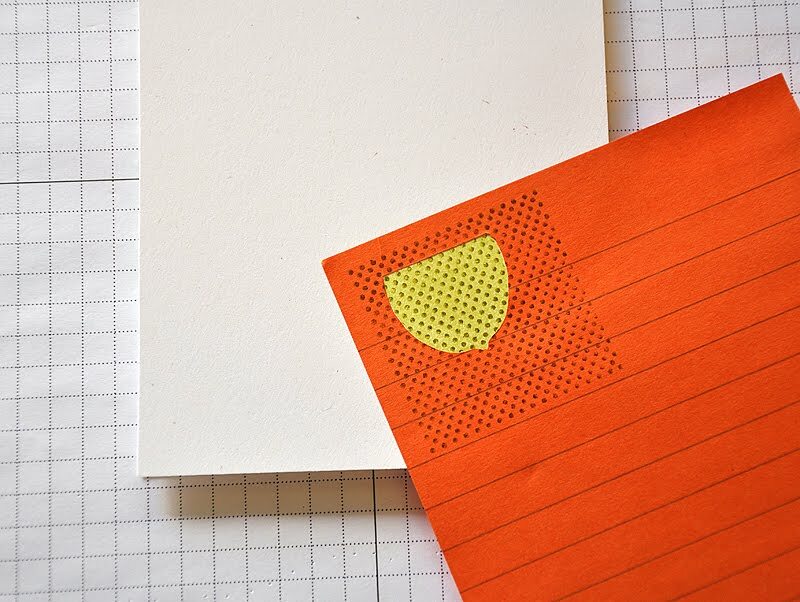 Cut out and placed a Post It Note mask and then stamped with polka dots (from Bitty Background Blocks) in Ripe Avocado. 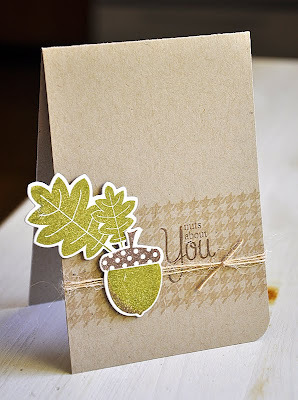 I then stamped the acorn top and leaf. 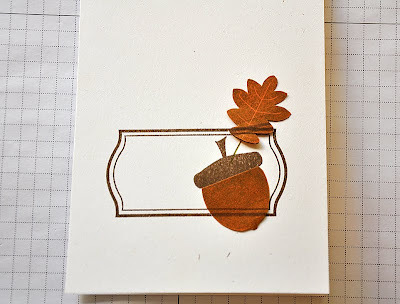 Next, I masked off both the acorn bottom and leaf and then stamped the frame (from the Fillable Frames Additions 2 set, also available August 15th). Removed the masks and stamped with the greeting. 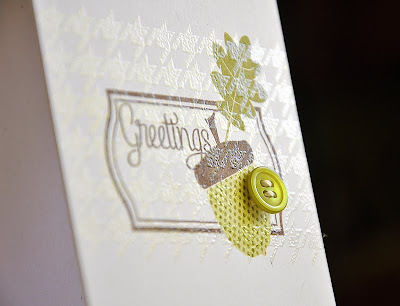 Once the ink was completely dry, I stamped a couple of houndstooth rows, in Versamark ink, across the card front and embossed with clear embossing powder. I love the shine that the clear embossing powder add. 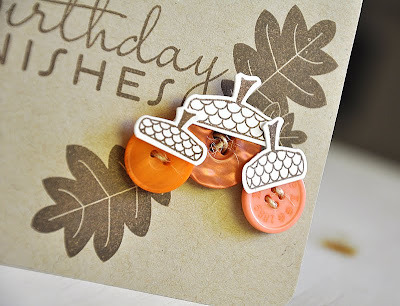 Then finished the card of with a Simply Chartreuse button. That's it from me today! 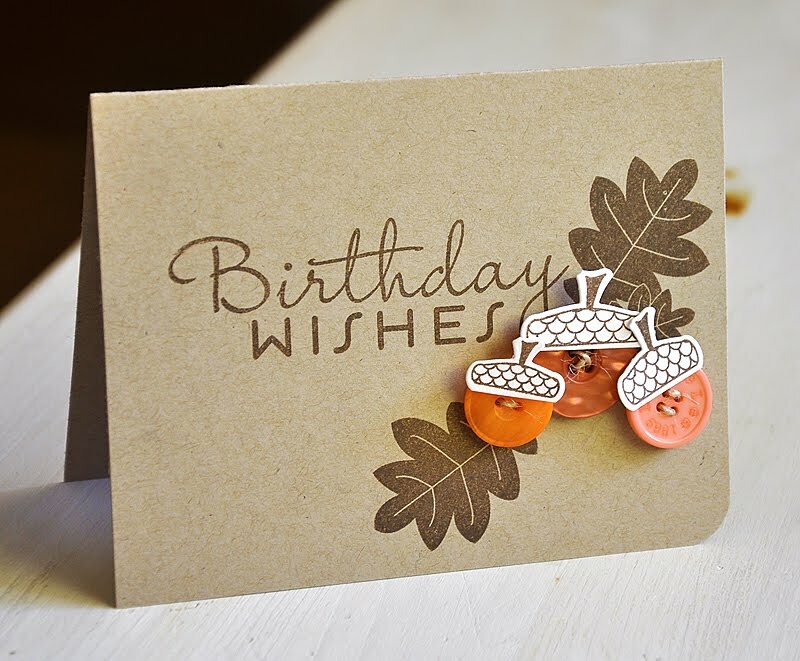 But don't forget, tomorrow (August 15th) is the day to get your hands on my newest stamp set and coordinating die at Papertrey Ink! Hello all! Today is the second Group Post day at Papertrey Ink. 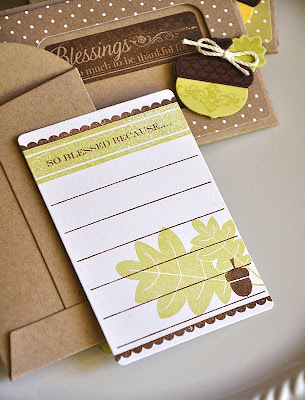 This time around each of us, on the design team, are showcasing the set Gratitude Journal, designed by Dawn McVey. Our assignment is to create a project that embraces an "attitude of gratitude". For today's project I've decided to focus on an "attitude of gratitude" while at the Thanksgiving table with family and close friends. It all begins with these autumn designed die cut seed packets turned into blessings place cards. Appropriate for placing at each seat at Thanksgiving dinner for family to fill out and turn into keepsakes and an annual tradition. Inside is a "so blessed because..." card that's all ready to be filled out. 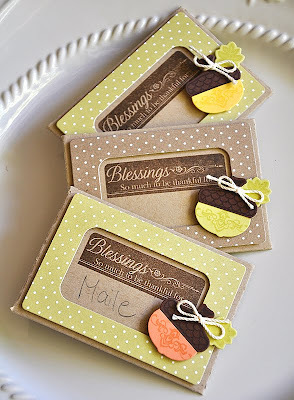 Stamped these using images from both Gratitude Journal & Autumn Acorns. 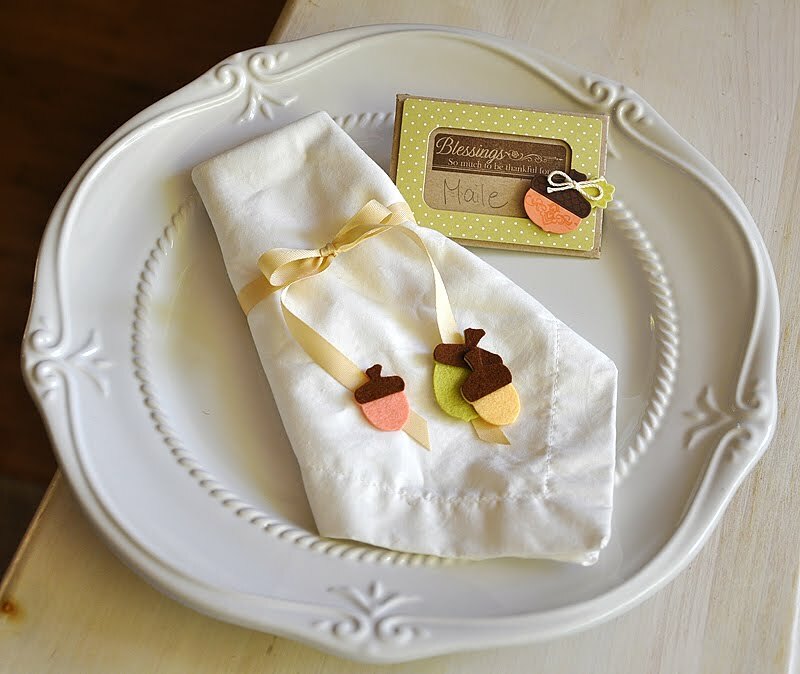 Each card is placed at it's proper place setting. 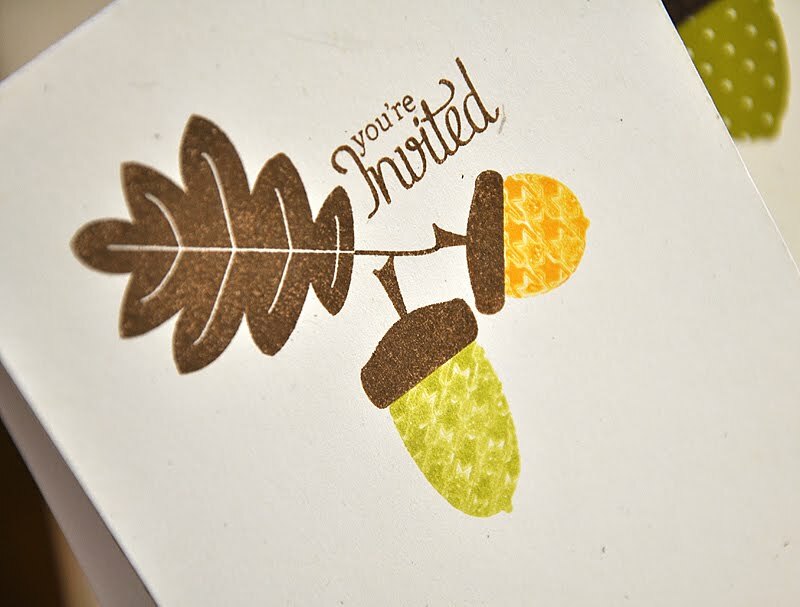 The seed packet was die cut from kraft cardstock. 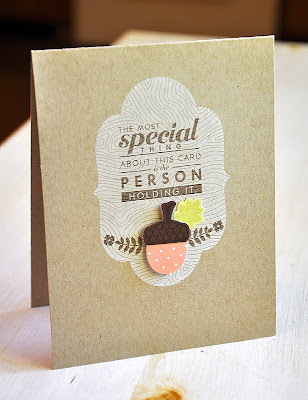 The frame (created by die cutting a Fillable Frames #7 from the center of a die cut Button Card) was die cut from Spring Moss Bitty Dot Basics pattern paper and attached with dimensional adhesive. Stamped the Gratitude Journal sentiment with in the frame and emellished with a die cut acorn, leaf and twine bow. For an added detail to each place setting, I created a coordinating napkin ring. 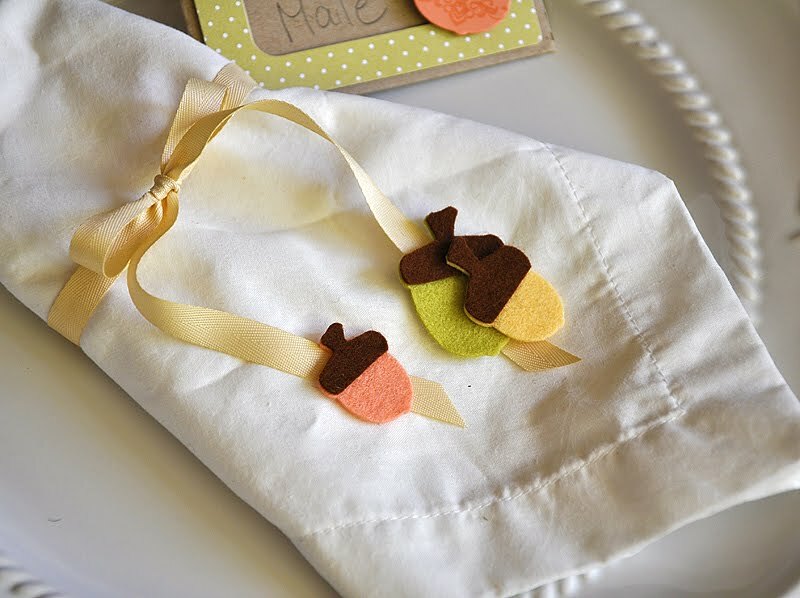 Simply tied the napkin with a Fine Linen ribbon bow, trimmed the ends (keeping them fairly long) and hot glued a few Autumn Acorns to the ribbon ends. Super simple, yet cute and can easily be mass produced. It's Day 4 of the Papertrey Ink Countdown and I've got some more projects to share with you today that showcases my newest sets & dies... 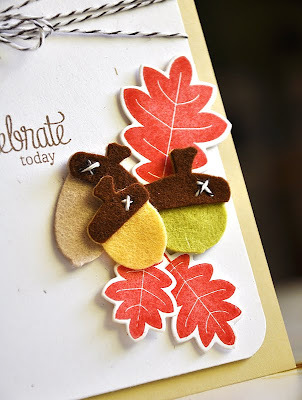 Autumn Acorns, Autumn Acorns Die Collection & Background Basics: Houndstooth (available begining August 15 at Papertrey Ink). Since this months release is all about the autumn season, I've been gravitating into color combos more fitting for the season. For today projects, I've been having fun with a new to me autumn color combo of Melon Berry, Spring Moss, Kraft and Dark Chocolate. 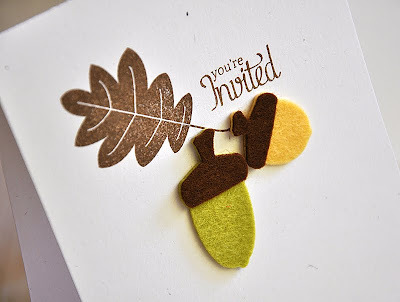 Usually a combination of green and melon colors have more of a springy look to them, but I've found that if you down play the colors (use them sparingly) and play up the neutral, the colors seem to be fitting for fall creations. I'm really liking! See what I mean? I love this Melon Berry Autumn Acorn! Started this card by stamping a Mat Stack #5 mat from Modern Wood Mats (available August 15th), in Fresh Snow, onto a kraft card base. Then let it set aside to dry. 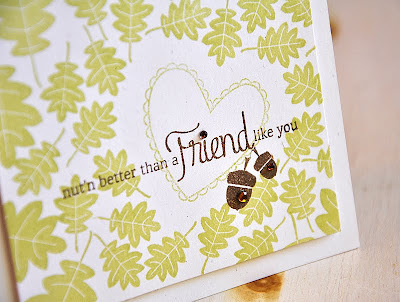 Once the ink was completely dry, I stamped the sentiment and flourish (also from Modern Wood Mats) in Dark Chocolate. 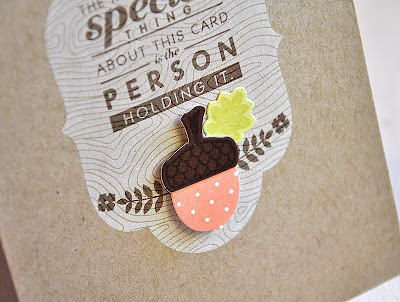 Die cut an acorn from Dark Chocolate and Melon Berry Bitty Dot Basics pattern paper, stamped the top with Versamark ink and pieced together. 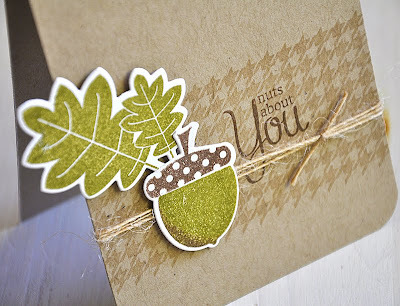 Die cut, stamped a Spring Moss leaf, layered behind the acorn and then attached to the card base. Easy peasy! Next up, a card utilizing the same basic color combo, but without the Spring Moss. An element I love to use in my cards is color blocking. For this card I've pieced together a few stripes of Melon Berry, Dark Chocolate and Kraft cardstock to create a houndstooth embossed color block strip, using Background Basics: Houndstooth. Die cut and trimmed a Fillable Frames #4 die cut, stamped with a sentiment from Modern Wood Mats and attach with dimensional adhesive. Wrapped the strip with brown embroidery floss. I originally wanted to tie a bow but I ran out of thread. Bummer. Then attached the strip to a Rustic Cream card base. Don't forget that all of the new goodies you're getting peeks at this week will be available for purchase at Papertrey Ink, beginning on August 15. That's it from me today, but for even more sneak peek goodness, be sure to visit Nichole Heady , Dawn McVey, Heather Nichols, Melissa Bickford, Michelle Wooderson & Jessica Witty. Hello! And welcome to Day 3 of the Papertrey Ink Countdown. 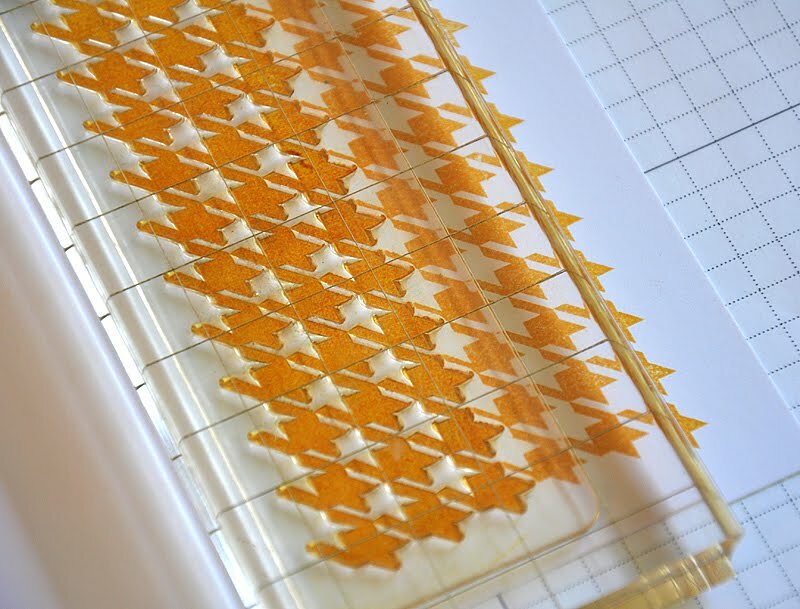 Today, Nichole and I are going into a bit more detail about my two newest stamp sets and coordinating dies... 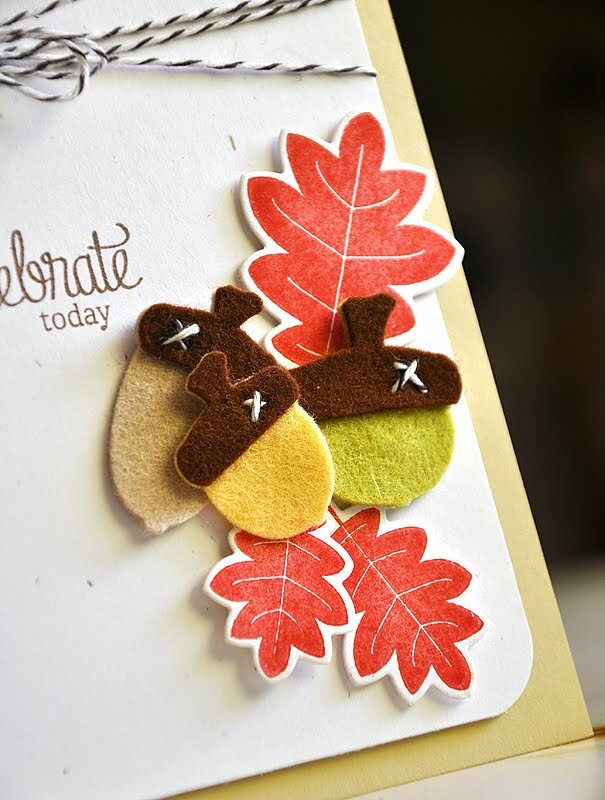 Autumn Acorns, Autumn Acorns Die Collection & Background Basics: Houndstooth (all available beginning August 15th at Papertrey Ink!). 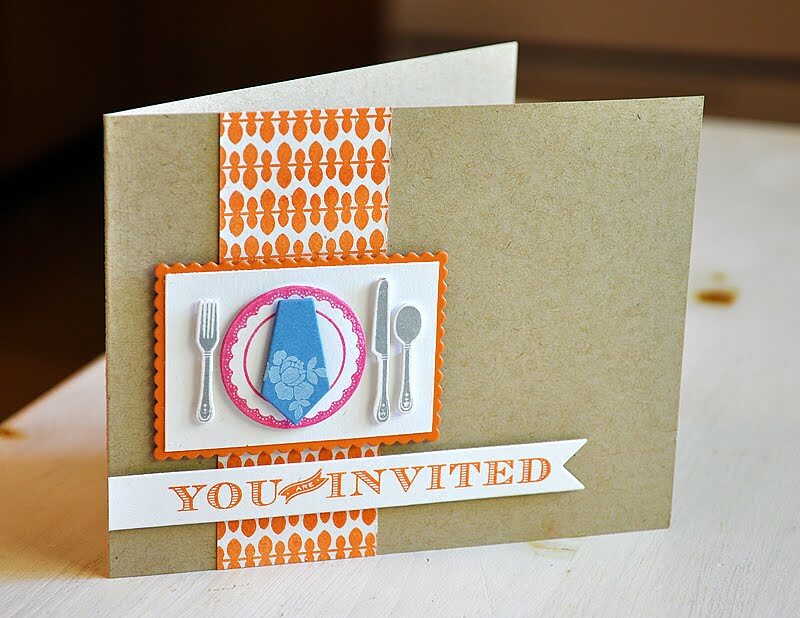 So, be sure to visit Nichole's blog too for all of the details and an assortment of her amazing projects. 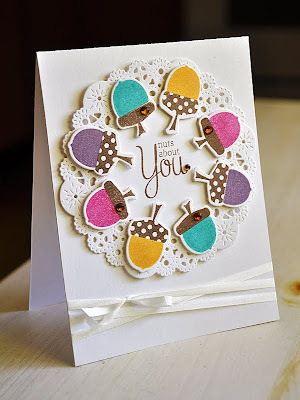 You can't go wrong with coordinating dies! 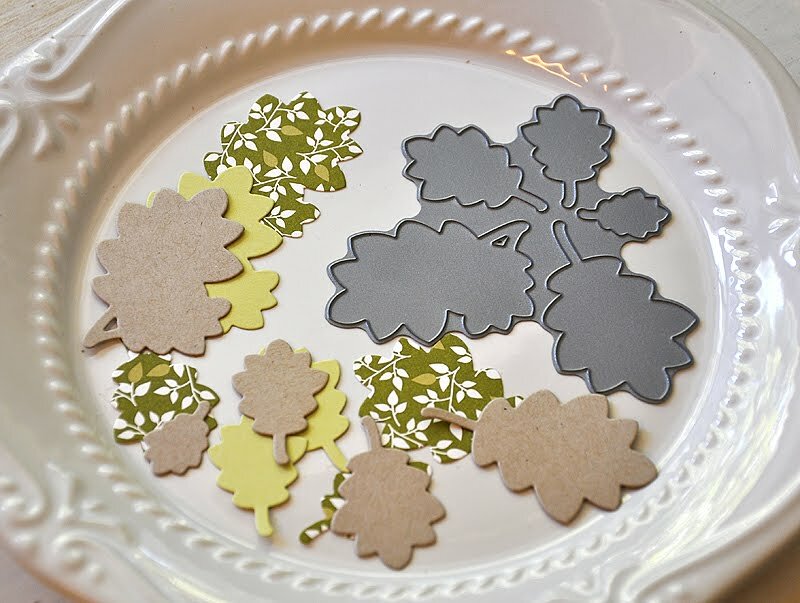 A set of fun shaped dies, one for the acorns and another for the leaves. 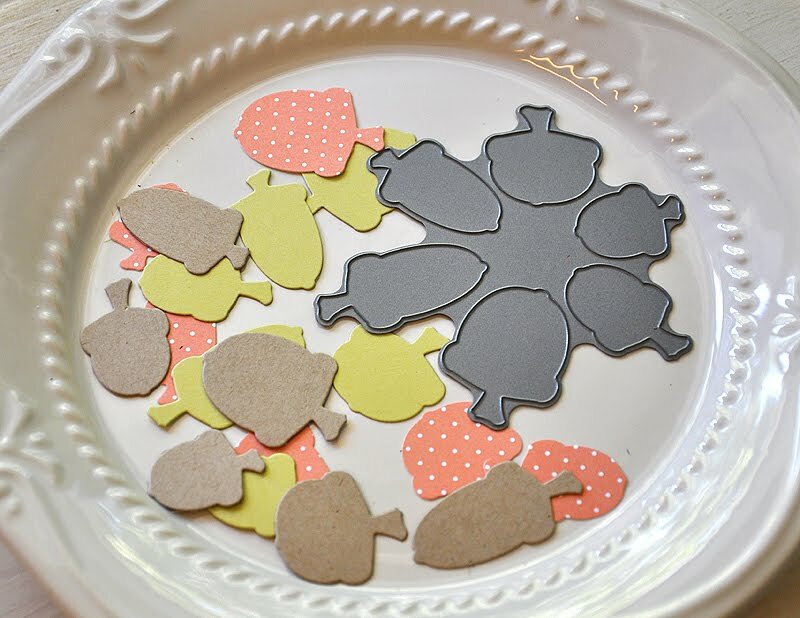 No fussy cutting needed, yay! And think of all the possibilities! 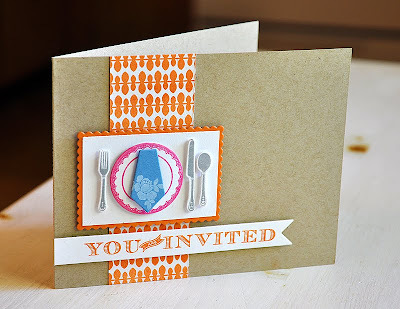 Here's an invitation trio. 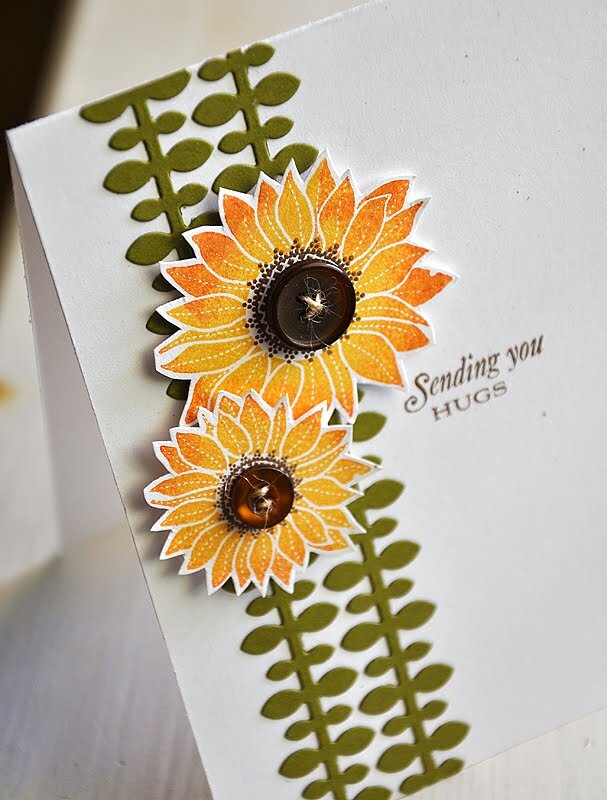 My vision behind this trio is to give you an idea of some of the possibilities available to you when using both the stamp set and the dies together. The Kissing Technique is a fun way to dress up those stamped acorn bottoms, like I've done here using Background Basics: Houndstooth. Paper piecing is fun! Just die cut two acorns from the desired cardstock or pattern paper, trim off the top and piece together. 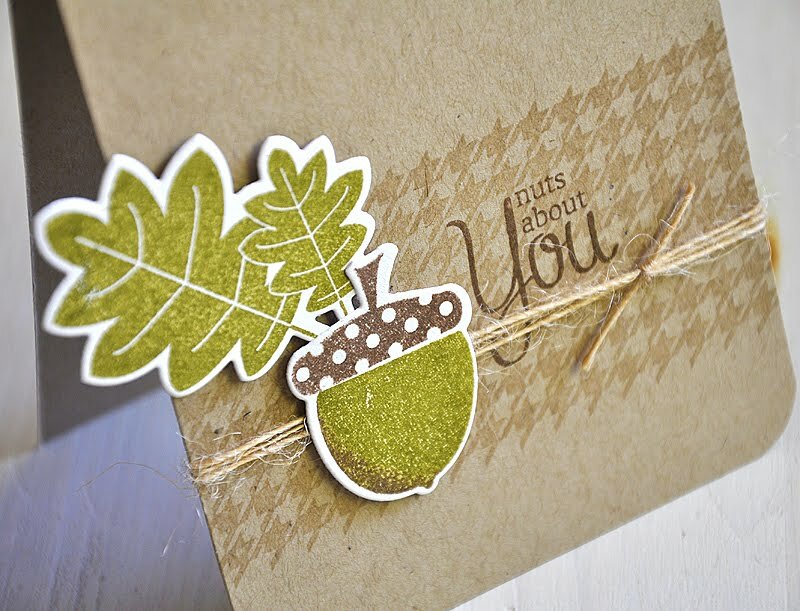 Felt acorns add a fun texture to any project or card. Lots of die action on the card above. I started by die cutting the leaves from Rustic Cream cardstock, stamped in Terracotta Tile and attached with dimensional adhesive to a Rustic Cream cardstock block. 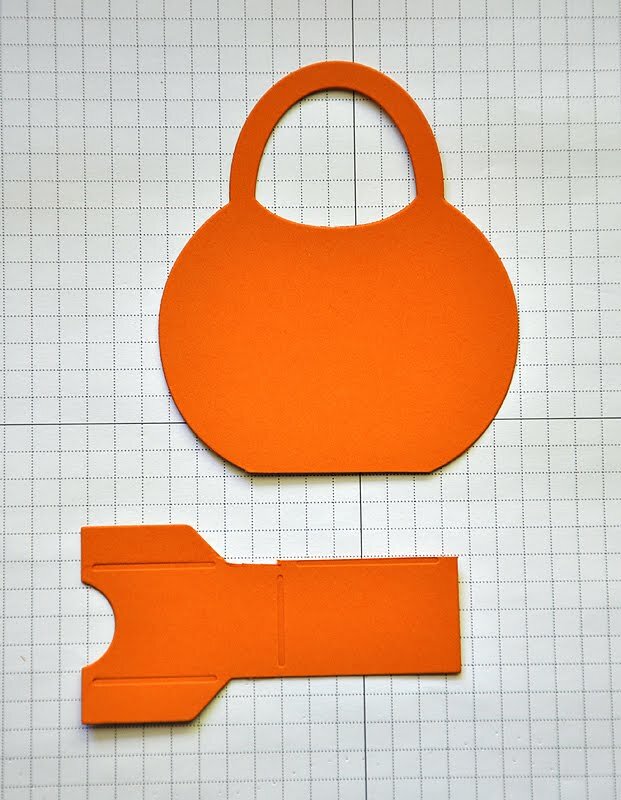 Then rounded all the corners of the cardstock block. Next, I die cut the acorns from felt (Dark Chocolate, Simply Chartreuse, Harvest Gold & Fine Linen) and then trimmed and attached the tops. Added a bit of Baker's Twine stitching to each and then attached into place. 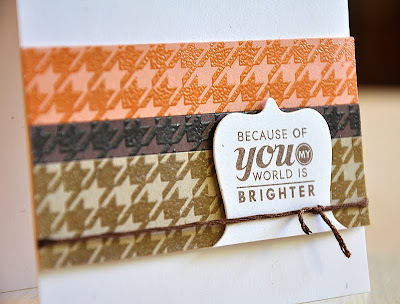 Stamped the cardstock block with "Celebrate Today" (a sentiment perfect for many occasions such as birthday, wedding & etc), wrapped with more Baker's Twine and attached to a Fine Linen card base. Next up, Background Basics: Houndstooth... As I mentioned previously, Background Basic: Houndstooth includes two background building strips, one in a large pattern and another in a small pattern. 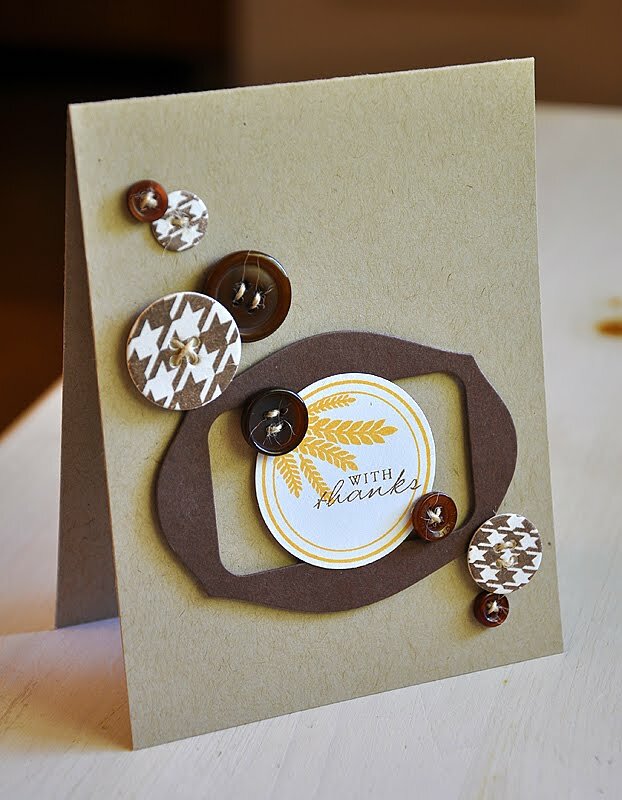 For this card, I stamped die cut buttons using both the small and large patterns, in Dark Chocolate. I paired the houndstooth patterned buttons with an autumn circle, from 2009 Autumn Tags, stamped in Summer Sunrise. Attached the circle on top of a die cut frame (created by die cutting the Fillable Frames #7 die from the soon to be release Layerz Mat Stack #1) which was adhered to a kraft card base. Then embellished with the hand stamped houndstooth and Dark Chocolate buttons. Now onto the stamp details... As mentioned before, by Nichole and myself, Background Basics: Houndstooth has been designed with an added feature to make background building easier. When finalizing this set months ago, Nichole had expressed to me that when using Background Basics: Gingham it occurred to her that it would be so much easier to line-up if the bases went out farther around the edges of the pattern. So, when creating the final files, I made sure to add an extra wide base to the images, an approximately 1/4" extension all the way around. Check out the extra wide base in the photo above. The added base width give you an unobstructed view through the stamp itself, allowing you to clearly see exactly were your are placing your next image. Making lining up your backgrounds a breeze! Check it out above. Here's a close up of the extra wide base in action! Well, that's it from me today. I hope you've enjoyed this detailed look into my new goodies for the month of August. Remember Autumn Acorns, Autumn Acorns Die Collection and Background Basics: Houndstooth will all be available for purchase starting August 15th, at Papertrey Ink. I honestly can't wait to see these sets in your hands and in action! But in the mean time, please let me know what you think so far. I'd love to hear!!! Now, for even more sneak peek goodness, be sure to visit Nichole Heady , Dawn McVey, Heather Nichols, Melissa Bickford & Lisa Johnson. Hello all! It's day two of the Papertrey Ink Countdown. I hope you all are enjoying everything so far! 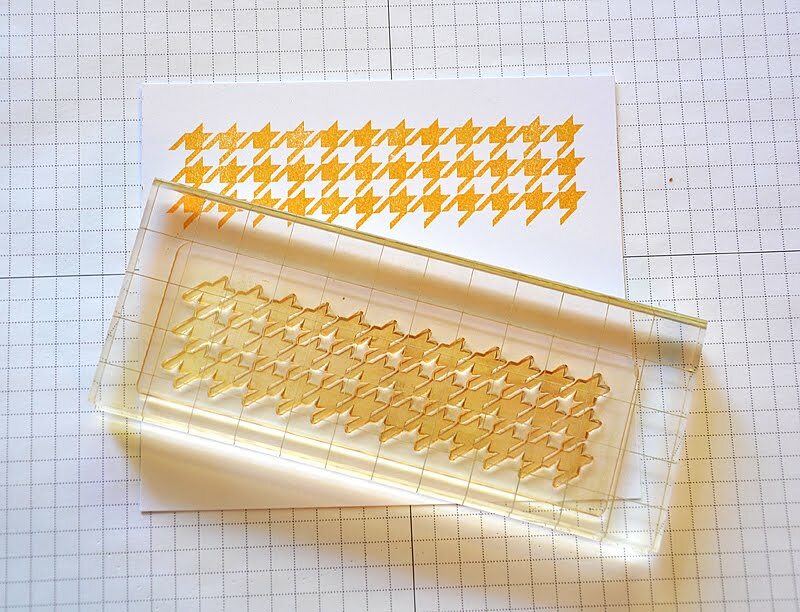 Well, I'm back today to share some more of my latest stamp sets... Autumn Acorns & Background Basics: Houndstooth. This time around I've chosen to focus on the masculine abilities of these two sets. So, here are a couple of cards perfect for the man in your life!... 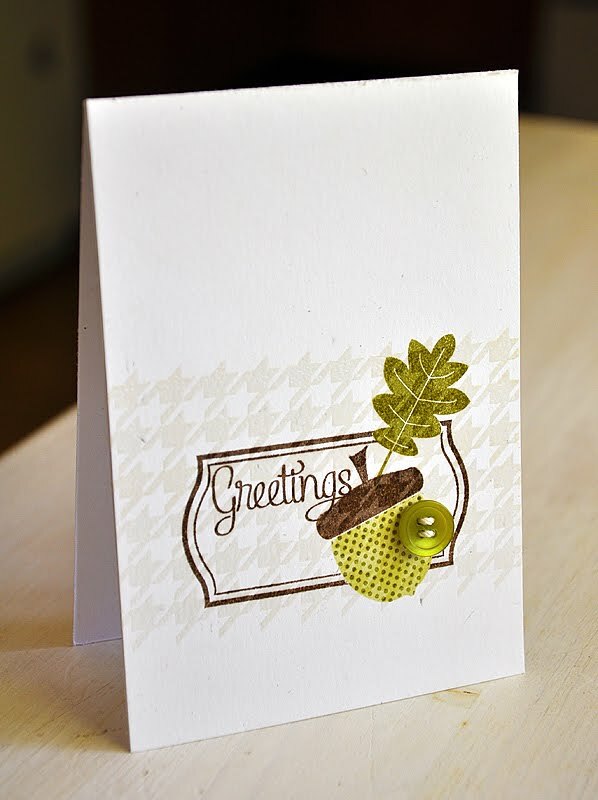 For my first card, I started by stamping a border, using the smaller pattern from Background Basics: Houndstooth, in Versamark onto a kraft card base. Then rounded the bottom right corner. 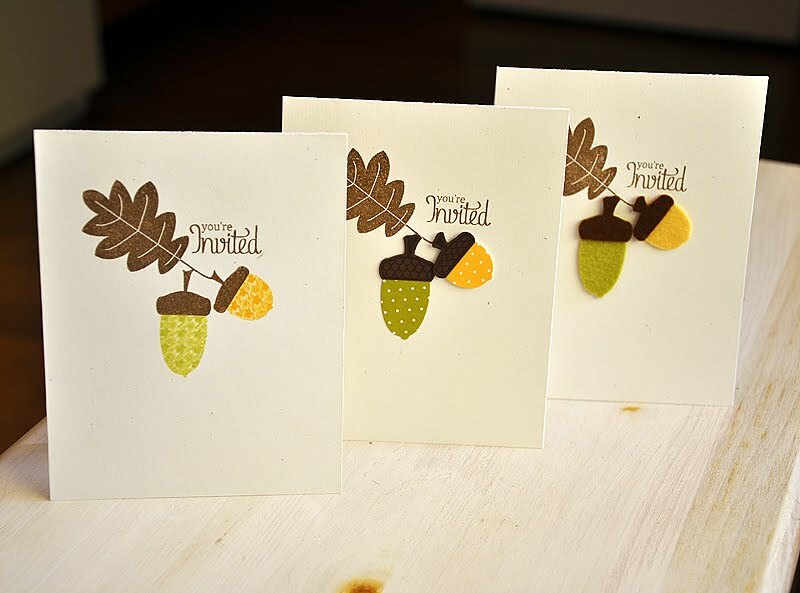 Die cut and stamped the leaves, acorn top and acorn bottom, from Autumn Acorns. I applied the Rock & Roll inking technique to the acorn, using Ripe Avocado and Dark Chocolate inks. Stamped the sentiment and wrapped the card base with some Rustic Button Twine. 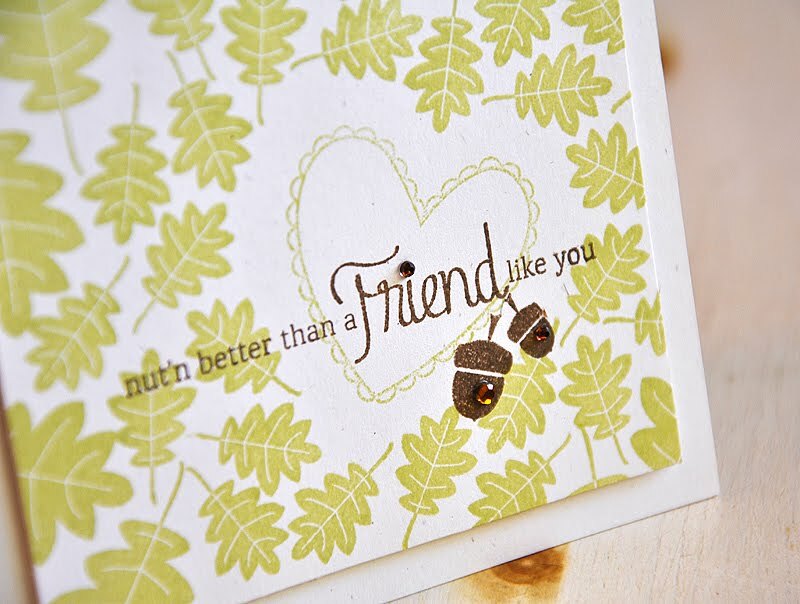 This second card is a play on this fun sentiment. 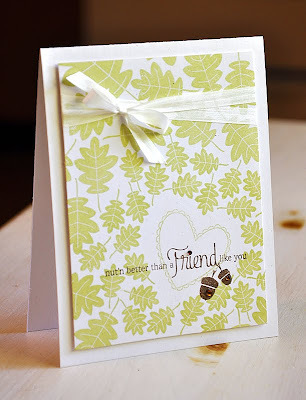 I die cut a Half & Half strip from a Pacific Vineyard pattern paper block and attached it to a Rustic White card base. 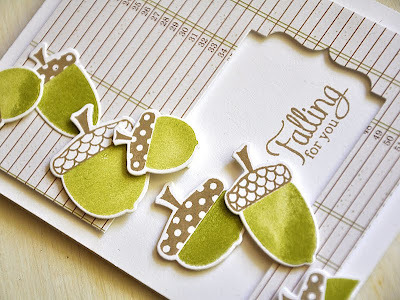 Die cut and stamped the acorns in varying shades of green. I arranged the acorns along the side of the card base to make them appear as if they were falling and then attached them, with dimensional adhesive, at different heights. 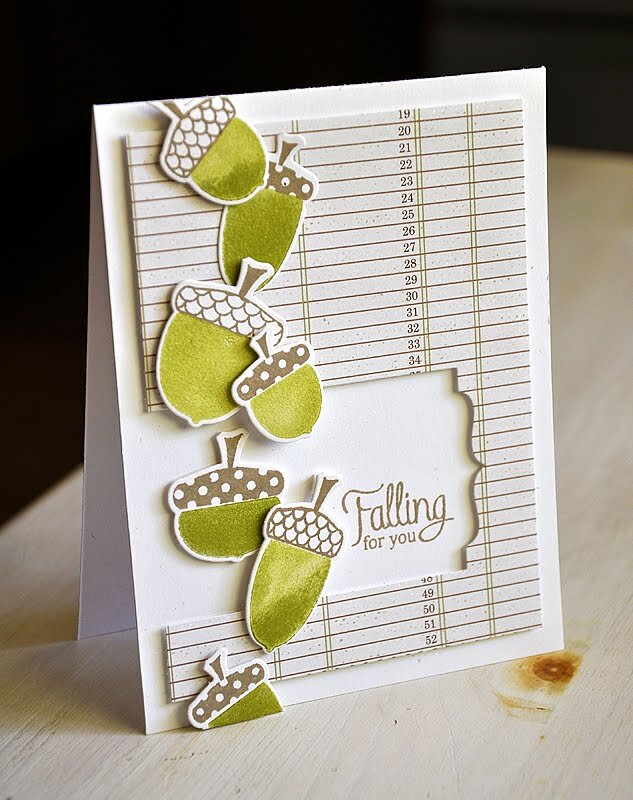 Finished the card of with "Falling For You", also from Autumn Acorns. So, I hope you've enjoyed these last two days of Autumn Acorns and Background Basics: Houndstooth. 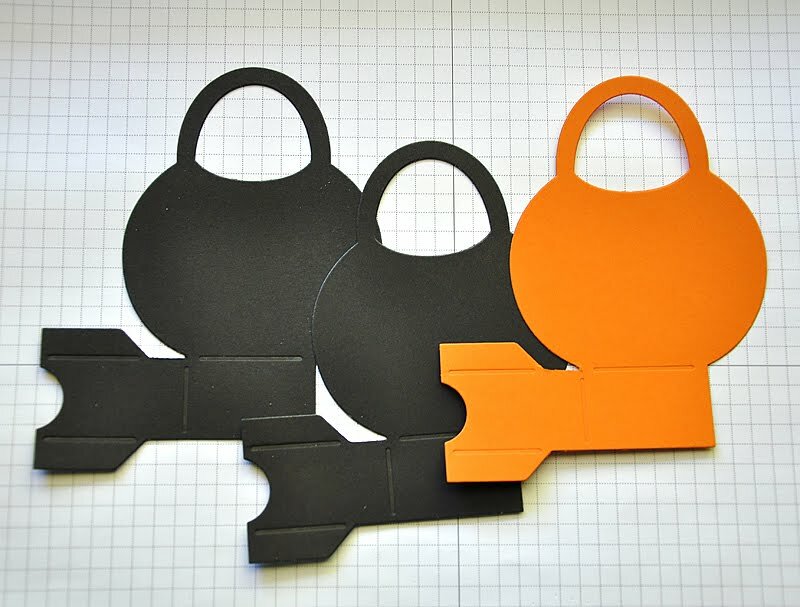 If you can't wait to get your hands on these sets, just remember they become available starting August 15th at Papertrey Ink. And remember... I'd love to know what you think, so please share! 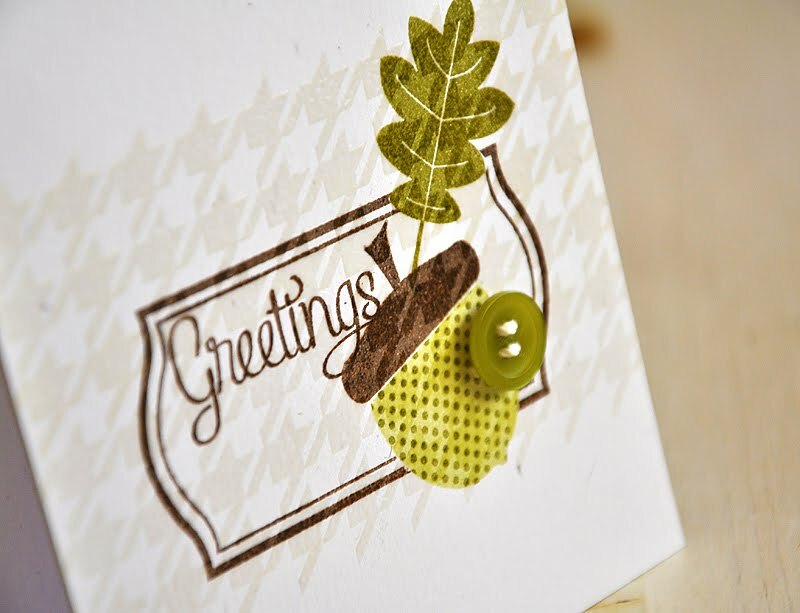 Now, for even more sneak peek goodness, be sure to visit Nichole Heady , Dawn McVey, Heather Nichols & Melissa Bickford. Hello all! Welcome to Day 2 of the Papertrey Ink Countdown and this months first Papertrey Ink Design Team group post. 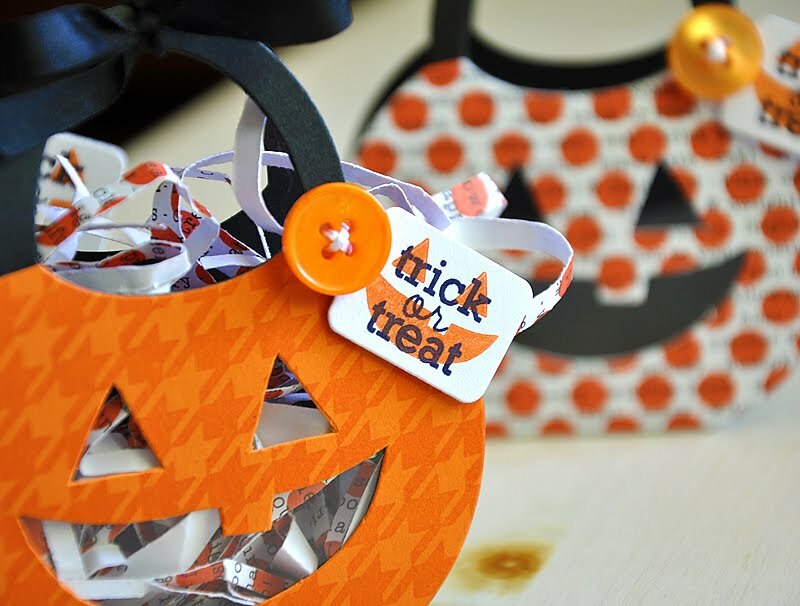 In preparation for the fall holidays, Nichole has asked the Design Team to create Halloween Treat & Sweets using Heather Nichols new stamp set... Halloween Treats & Sweets. Two versions, a large scale and a mini application of this adorable set and it's coordinating dies. 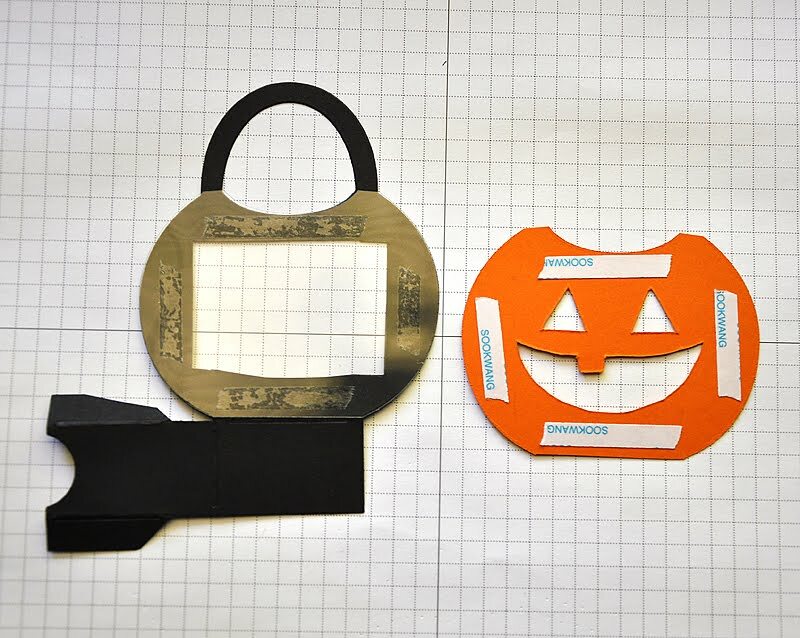 For my large scale project, I chose to work with the pumpkin... 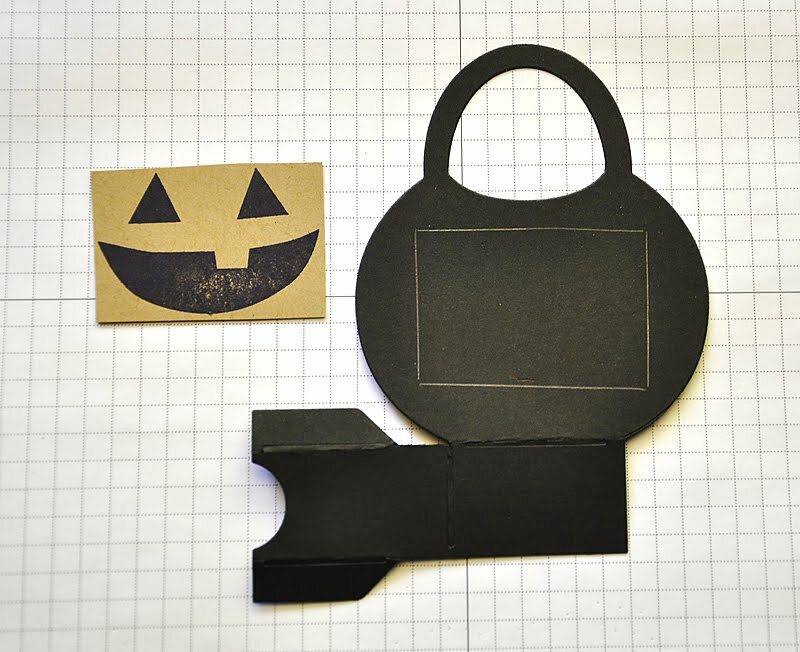 The coordinating Favor It Box #6 is perfect for assembling adorable Halloween treats & sweets. 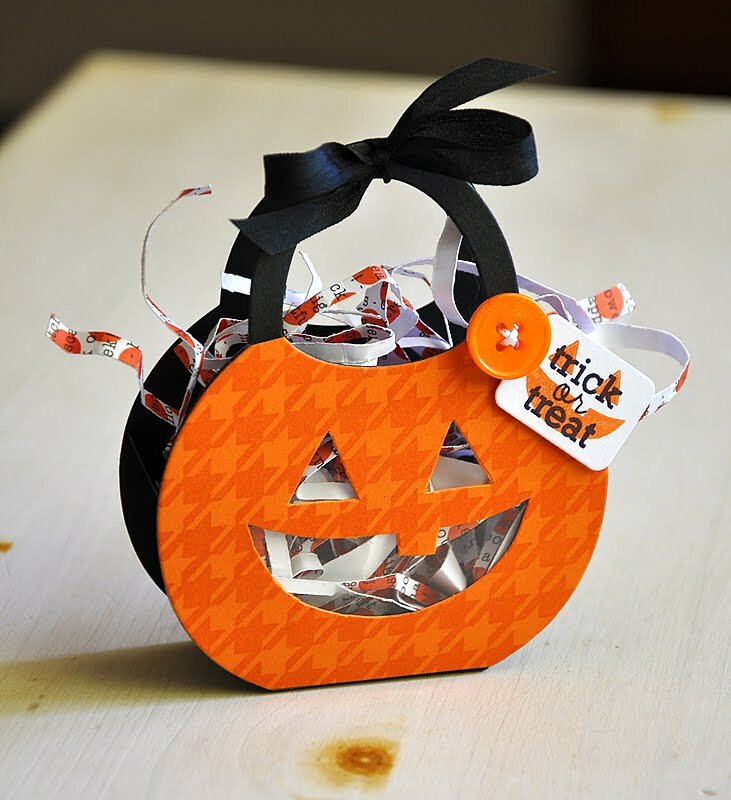 This sweet pumpkin goody box, with it's Clearly Creative Jack O' Lantern windows, gives you just a peek at what's inside. More instruction on how to create this special treat box below. I loved the way this goody box turned out and I couldn't stop at just one. 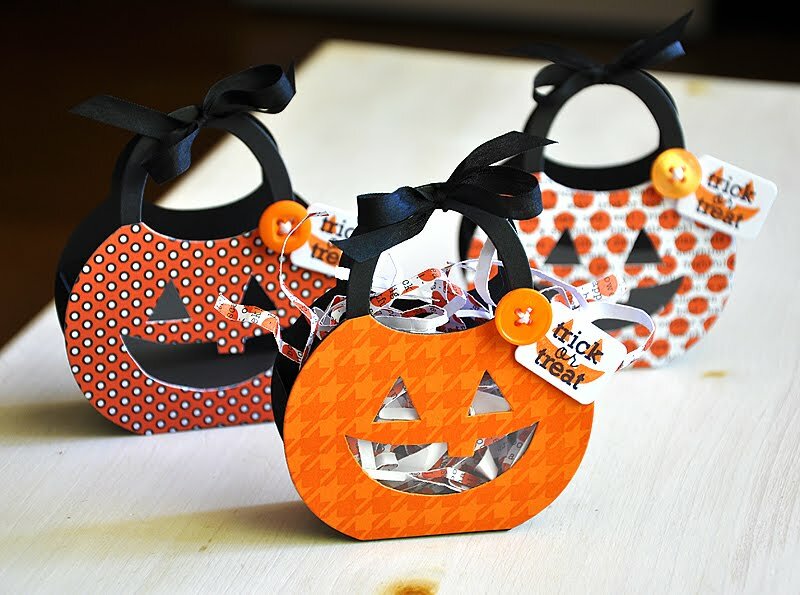 I used a couple sheets of Halloween Prints pattern paper to create a coordinating trio. Stamped the first goody box with Background Basics: Houndstooth and then embellished all three with a Orange Zest button and a coordinating tiny tag. 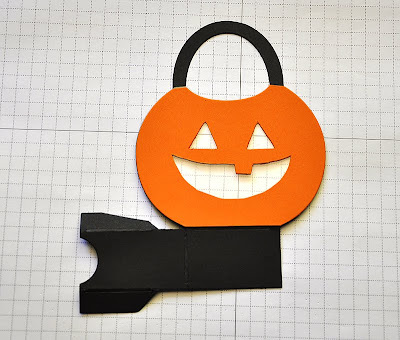 Die cut the Tiny Tags from white cardstock, stamped with a Jack O' Lantern smile and a sentiment and then attached. Topped them off with a black satin ribbon bow. 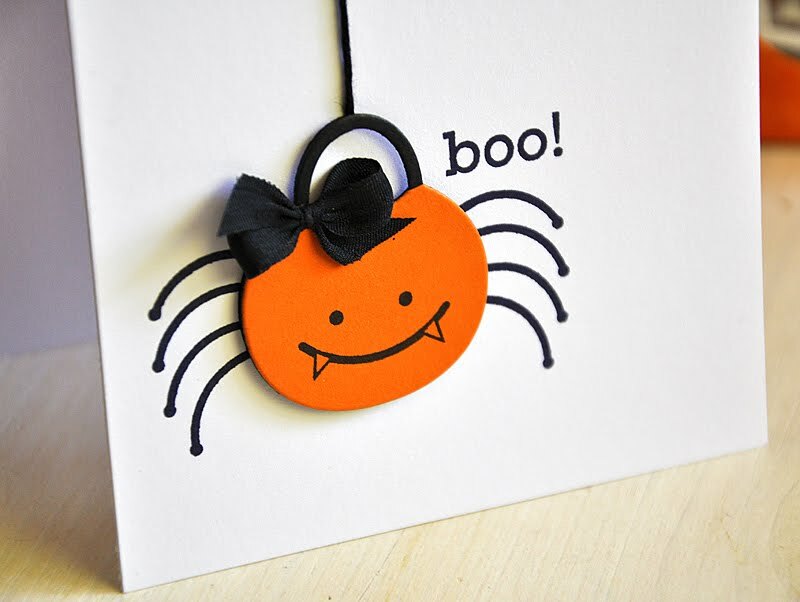 And now... a miniature version of these adorable Halloween Treats & Sweets! 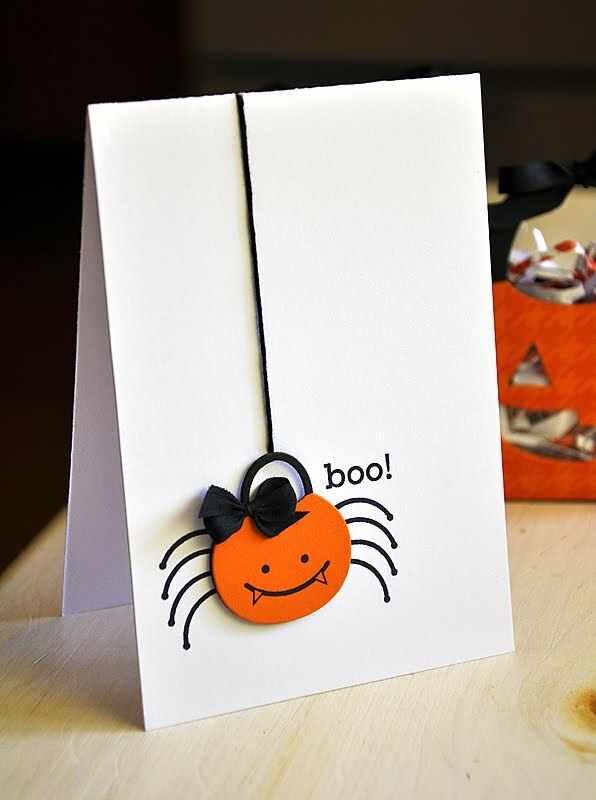 I dangled this spooky but "oh so cute" spider bucket from an embroidery floss web. 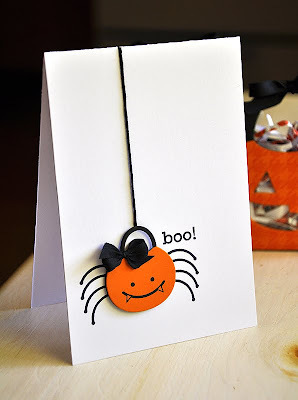 I started by stamping the spider bucket and sentiment directly onto the card base. Pierced a hole at the top of the card base and the bucket, threaded with black embroidery floss and tied ends together inside. Die cut the bucket from True Black and Orange Zest cardstock, trimmed off the top of the orange bucket and attached it over the black one. Stamped the face, attached to the card base and embellished with a bow. 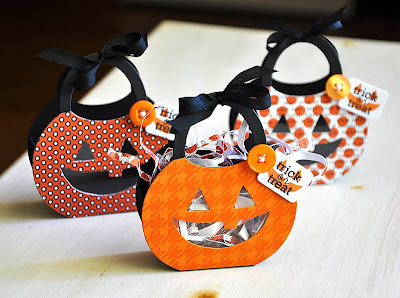 Now, onto how I assembled the pumpkin Halloween Treats & Sweets boxes... Here's How: I started with three Favor Box #6 die cuts. Two for the box and one for the front. 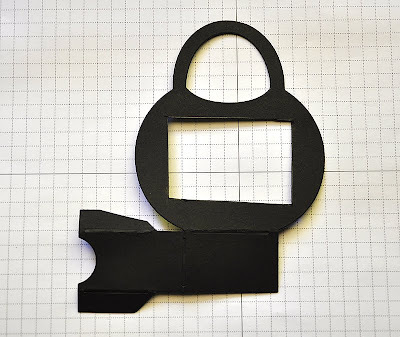 Trimmed off the bottom portion of the third Favor It Box #6 die cut. Stamped the pumpkin face. At this point, if you choose, this is when you would stamp a pattern onto the pumpkin front. Trimmed off the top with scissors. 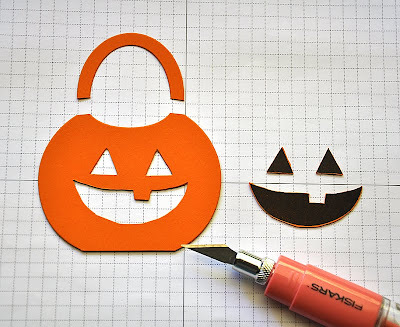 With a craft blade, I carefully cut around the stamped pumpkin face. 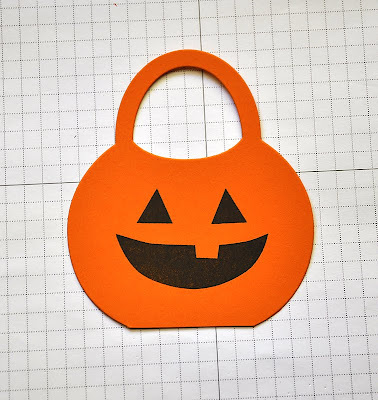 Stamped and cut a scrap pumpkin face, to use as a template. Using a pencil, I traced the template onto the front of the Favor It Box #6 die cut. I then cut along the pencil lines. Also note.... To ensure that the side flap of the box was not visible, once assembled, I trimmed a tiny bit of the flap off. 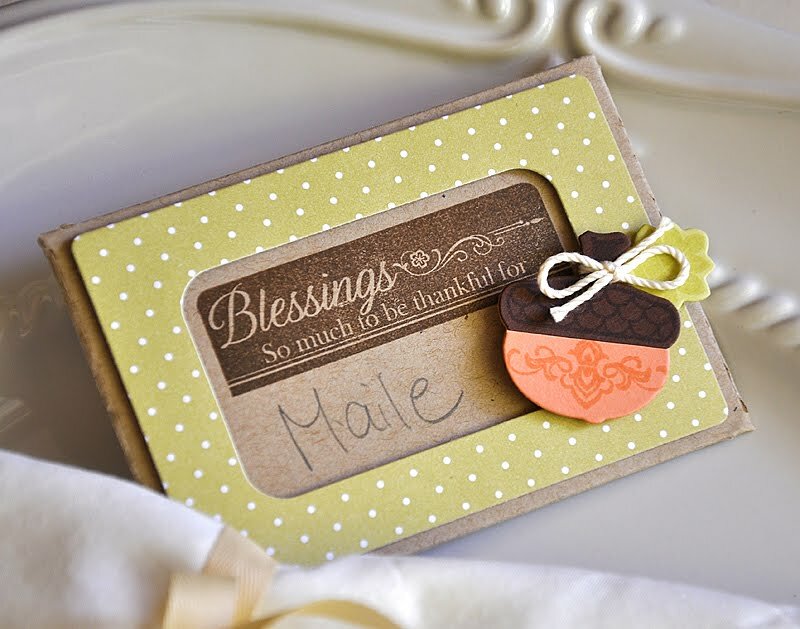 You will also need to do the same to the other die cut side of the favor box as well. I die cut the Favor It Box #6 front from Clearly Creative Cardstock and trimmed off the excess. 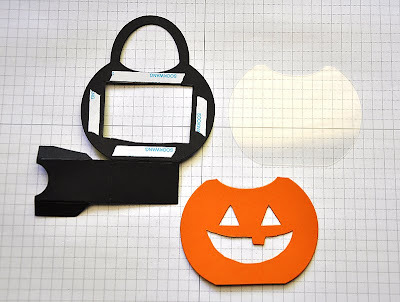 I now had three pieces (the box, pumpkin front and the die cut clear cardstock) to assemble the box front. Using Scor-Tape, I attached the clear cardstock to the box and then the pumpkin to the clear cardstock. Once the layers were attached, I assembled and embellished the box.